Vivacious power pop with Chuck Berry swagger arrives in the form of “You Did It,” the new single from England’s Murph And The Gazorpos. 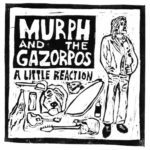 The latest musical outlet for Charlie Murphy (Red Cords), Murph And The Gazorpos will release A Little Reaction, the band’s second EP of the year, on 21 October via Super Fan 99 Records. Soon to be available for pre-order, A Little Reaction will be limited to 30 cassettes with “You Did It” and a bonus track included on 5″ vinyl. Stream “You Did It” below.